Video clip synopsis – Imparja Television allows Indigenous communities to tell their stories and to communicate both with each other as well as the wider Australian community. Broadband MP4 imparja_bb.mp4 (2.3MB), suitable for iPods and computer downloads. 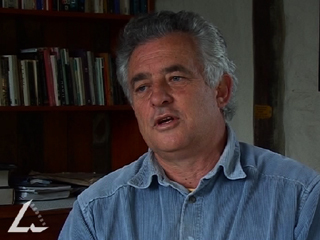 The interview with Mac Gudgeon was recorded for the website From Wireless to Web, produced in 2005. In 1986, the Central Australian Aboriginal Media Association (CAAMA) formed Imparja as a company to bid for the proposed commercial television licence for Australia’s Central Zone. Imparja’s bid was supported by State governments in both the Northern Territory and South Australia. Imparja’s first transmission – coverage of the Australia vs Sri Lanka cricket Test – was broadcast to Alice Springs on 2 January 1988. Broadcasting live via retransmission sites at Ceduna, Coober Pedy, Leigh Creek and Woomera in South Australia, and Alice Springs, Tennant Creek, Katherine and Bathurst Island in the Northern Territory, Imparja reached a total audience of 62,000 people. Imparja has expanded at a steady rate since 1988. In 1990, the station launched Imparja Local News – a 15-minute insert of local news into the national network bulletin. Imparja also covered the Northern Territory elections live from its Alice Springs studio. By 1993 Imparja’s viewing audience had grown to 125,000 people. Why do you think it is important for Indigenous people to own their own television station? What advantages can you see for remote communities in having access to Imparja? Create a map of Imparja in terms of its national reach.